Running Technique Workshops and Groups Suitable For All Abilities at Baslow Sports Field and Longshaw Estate. We are designed to run. Whether you’re an experienced runner or are just starting out, benefit from the expertise and experience of Britain’s Former Female Athlete of the Year and twice European 800m medallist, Becky Lyne, as she guides you toward running GRACE-fully. Using this memorable acronym you will be taught how to tap into the ‘free energy’ so successfully exploited by professional athletes. Not only will this greater understanding and execution of the body’s innate movement patterns unlock faster PBs, it will also serve to reduce injury and create a more positive mindset when running. – Slow speed personalised video analysis – copies of which will be sent to you. beautiful surrounding countryside (Chatsworth and Baslow Edge are right on the doorstep). – Bonus body maintenance session of foam rolling, trigger point release, zen chi relaxerciser and self massage whilst discussing how to apply GRACE in your everyday life. – Free home-made protein balls and energy drinks! Spaces on workshops are limited to 10 people to enable us to give participants sufficient attention and feedback. If a course is fully booked you will be added to a waiting list or we can book you onto another workshop. Workshops will proceed subject to a minimum booking of 5 people. If there are fewer than this, you are entitled to a full refund or we can book you onto another date. We also offer 90 minute private technique consultations allowing for more in-depth analysis and personalised recommendations. Contact us to arrange a convenient time and location . Price = £50, additional attendees £10/person. Join Britain’s former Female Athlete of the Year, Becky Lyne, at her friendly, mixed ability groups for progressive interval sessions. With runs tailored to meet all levels and distance preferences, everyone is welcome along in their quest to improve their fitness – and speed! Sessions commence with 15min mobility and core activation/strengthening and end with optional 15-30min body maintenance. Technique advice comes as standard, as does a friendly camaraderie to help you push yourself harder than you would on your own! Grass track sessions. Opt for endurance or sprint/agility (- ideal for improving performance in team sports!). Meet at the Pavilion DE45 1SP. Click here for directions. All welcome 6yrs+. Timed intervals, hill reps or fartleks. 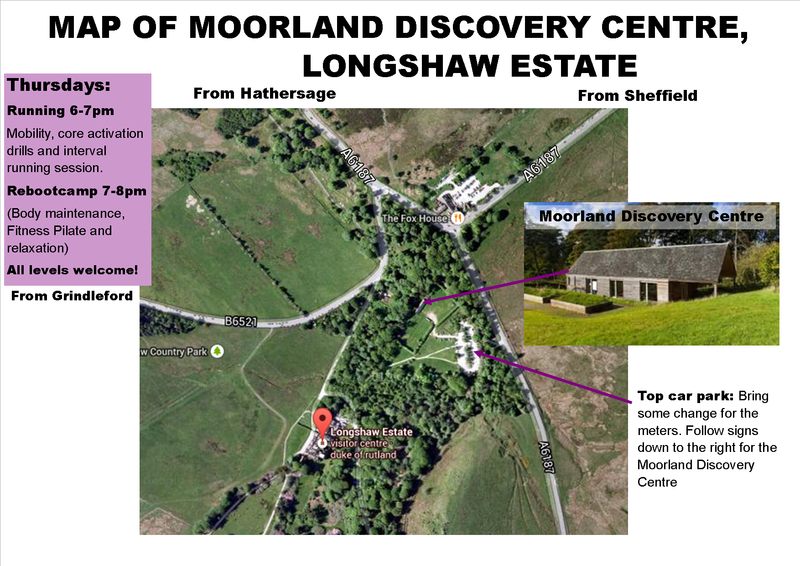 Meet Moorland Discovery Centre, S11 7TZ. All welcome 8yrs+. For better value and motivation, sign up to our Charitable Monthly Subscriptions for just £12 per month. 10% of all subs each month go to charities participants are raising money for through races. If no one is doing a fundraiser that month then the default charities are the Gathimba Edwards Foundation, Love Mercy and Shoe4Africa. Pay as you go price is £4.50. For instructions of how to sign up to our online payment system, please click ‘How to register’ at the top of our Try-Sports and Fitness page.